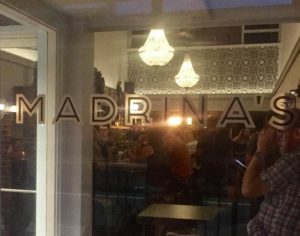 Downtown Gainesville’s newest cocktail bar, Madrina’s, opens this week with a stellar drink menu that centers around rum and other island-inspired concoctions. T.J. Palmieri at the bar inside Madrina’s, which opens Friday. T.J. Palmieri sat at the bar inside Madrina’s last week, coaching his four-person bartending crew on how to create the ideal frozen daiquiri. Some observers might have equated the scene to chemists doing lab experiments. Blenders whirred to get just the right mixture of ice, rum and fresh flavor to come through, with just the proper consistency. Although Palmieri didn’t want to divulge the four daiquiri flavors until the bar’s opening (Spoiler alert: One of them is banana), the desired result was a daiquiri that slid from the blender into the glass like soft-serve ice cream. 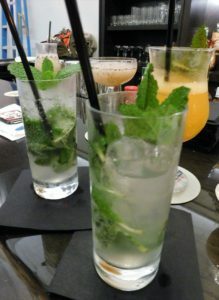 “Using a blender is a technique that’s been employed in Cuba for decades and something that creates a texture you can’t achieve by shaking or stirring a cocktail,” Palmieri said before sampling the daiquiri through a straw and giving it his approval. Palmieri, a veteran of the bartending scene in Gainesville and his native Miami, is the operating partner at Madrina’s, which opens at 7 p.m. Friday in what once was half of the old Stubbies & Steins Pub at 9 W. University Ave. Madrina’s will be open Tuesdays through Sundays from 4 p.m.-2 a.m.
Palmieri said that Madrina’s is what he thinks a Cuban bar should be if Havana had access to ingredients and spirits education. “This bar is an extrapolation of what a Cuban bar would be if they didn’t have the embargo,” he said. Doing the bar right is important to Palmieri for personal reasons. His mother was born outside Havana. Her family owned a renowned bakery called Los Pinos Nuevos (The New Pines). The drink selection at Madrina’s includes mojitos. Walk into Madrina’s and you will immediately sense an Old World influence in the color scheme, the white chandeliers from Spain, the dark-wood bar and the Arabic-style concrete tile on the back wall. The interior-design work was created by artist/designer Nitin Jayaswal. The Cuban influence is most noticeable by the nine santos, or small religious statues, that sit atop the liquor shelves. The colorful icons, including one of Our Lady of Guadalupe, are on loan from local art collector and gallery owner Héctor Puig and give Madrina’s an authentic touch. “There really isn’t a Latin American bar in Gainesville that caters to this niche,” said Palmieri, who visited Cuba twice with his bartending mentor, Julio Cabrera. 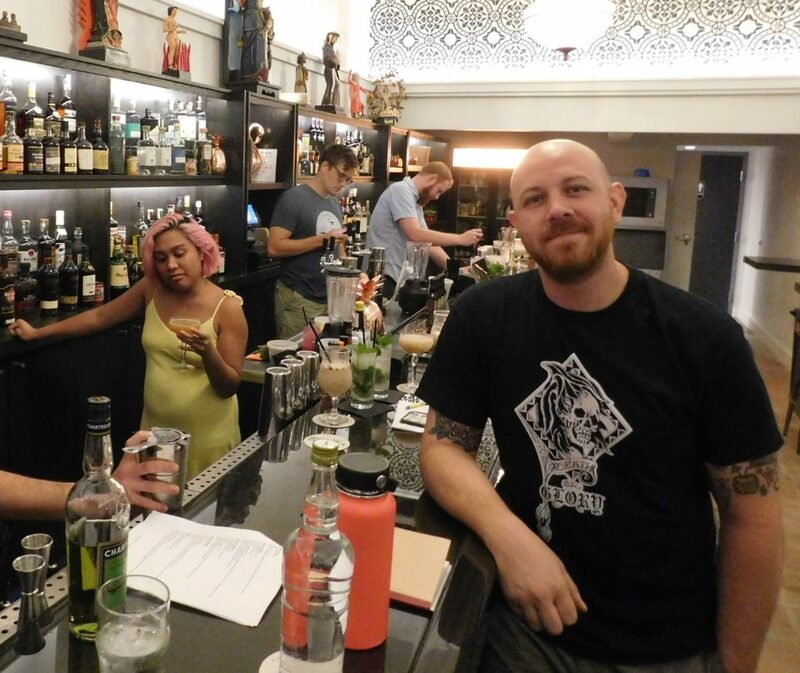 Cabrera trained Palmieri for a competition known as the World Class Bar Contest. Earlier this year, Palmieri reached the U.S. regional finals in New Orleans. Palmieri is best known in Gainesville for his years running the 2nd Street Speakeasy, which received national recognition for its creative cocktails. He’s also been the bar manager at Dragonfly Sushi. 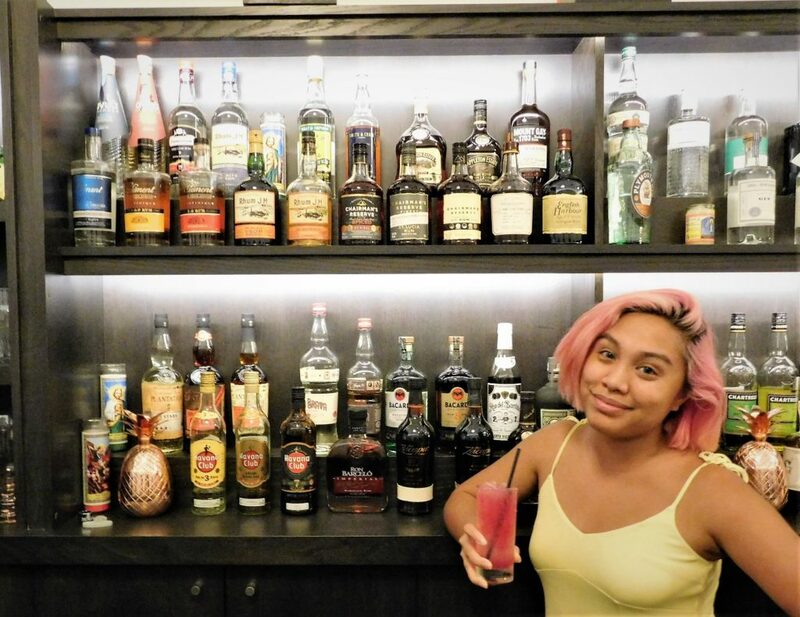 Head bartender Kat Maningo and a colorful libation. Madrina’s has been creating a buzz for the past year with pop-up events at Crane Ramen, Sidecar Gainesville and Alpin bistro. Its soft openings the past week have been so successful that Madrina’s ran out of rum! College students are welcome to the bar, but Madrina’s will likely draw from local residents looking for a refreshing cocktail or young professionals wanting to wind down with craft beer or wine. 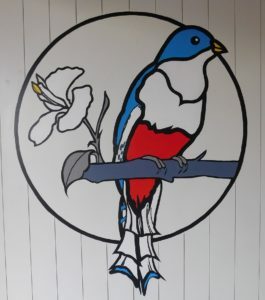 For further info, visit Madrina’s on Facebook.